When Reagan took office in 1981, he began a campaign to undertake significant increases in defense spending. By 1983 he had passed the Strategic Defense Initiative (SDI) and the Strategic Computing Initiative (SCI). While these two projects were not practically linked, they were so for political reasons. The SDI or “Star Wars” sought to protect the US from Soviet launched nuclear intercontinental ballistic missiles utilizing a variety of space and ground based technologies. The SCI sought to develop different military applications in the areas of artificial intelligence, robotics and hardware development. Moreover, the Army’s new strategic doctrine, the AirLand Battle (1983) heavily influenced the trajectory and the development of these particular technologies. The AirLand Battle concept emerged as the way forward for the US to counter a numerically superior adversary (Russia) by utilizing a technological advantage. Here, the US began pursuing programs such as autonomous land vehicles, AI software running battle management programs, AI software allowing for situational awareness (both for pilots and ground based forces), and massive pushes for stronger computing power, as well as chemical lasers, directed energy weapons, a hypervelocity rail gun and a satellite based missile interceptor system. The Air Force desired better tactical ability for its fighters, as well as stealth technology and unmanned aerial vehicles, and the Army wanted autonomous land vehicles, battlefield and logistics management, and better stand off weapons (such as smart bombs). The Navy, at this time, was likewise pursuing similar tracks but was not as heavily funded through these initiatives. The result was billions of dollars spent from 1983-1994 and a handful of powerful new technologies in the US military’s arsenal. The SDI and the SCI shaped military doctrine, and military doctrine shaped the pursuit of particular technologies. By 1991, the US no longer faced a threat from vast numbers soviet ground forces, and the raison d’être of the build up, the Cold War, was moot. Yet the US possessed new technologies that it had not had the opportunity to test operationally. The Gulf War of 1991 offered the US a chance to not only come to Kuwait’s aid and thwart an Iraqi invasion of Saudi Arabia (and its vast oil fields), but also to trot out its new arsenal and prove the success of the AirLand Battle concept in action. Relying heavily on airpower and ground forces, the US led Coalition dealt a devastating blow to Iraq. While it is outside of the scope of this brief essay to engage fully with many of the nuances of Operation Desert Storm, and the regional and geopolitics of the time, we can say that the war itself had long roots back to Reagan and the Carter administration. What is more, and for present purposes, other powers in the system—particularly China—watched how the US waged war. In particular, they observed and began thinking about ways to disrupt and deny the US’s ability to work this way. This counterstrategy became known as A2/D2: anti access/anti denial. The A2/D2 strategy is designed to limit the US’s ability to utilize its long-range strike capability and air power. Utilizing ballistic and cruise missiles to take out air bases, as well as anti-ship ballistic missiles and subsurface vessels to seriously hinder maritime power, the US faces strong opposition in both the air and sea domains from any utilizing this approach. Moreover, a networked system of surface to air missiles and modern fighter craft means that US air power would not face a permissive, but rather a hostile, environment. In other words, the means and supremacy the US possessed in 1991 Iraq—to even get boots on the ground—would not work in areas of A2/D2. What does this mean for Middle Eastern policies? Well, for the recent past, it means that US military capacities and how the US has fought (or decided to fight) in is highly dependent upon when it thinks it can win with AirLand Battle strategies. 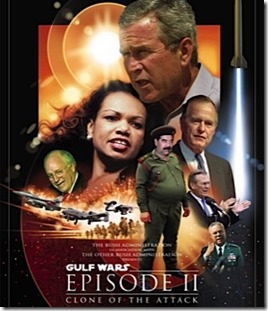 While it is a gross under statement to say that Bush 43 undertook the 2003 Iraq invasion without considering long-term strategic implications, and that he more than likely was influenced by his father’s experiences with Desert Storm, the playbook for 2003 looked very similar to 1991. Where things began to unravel quickly, however, was on Land front of the AirLand strategy. Not considering the likelihood of an insurgency, the administration was infamously ill prepared. This brings us up to 2003, when Scarborough posits that Bush’s ideological fervor took over in the face of “sound reason.” This explanation is only half the story, though, and an easy half at that. Bush’s response to the 2001 terror attacks and the subsequent NATO campaign in Afghanistan play a role in some of his decision making in Iraq, as does his unchanging belief in superior technology and the “welcoming” of liberation by Iraqi civilians. By the time that President Obama took office in 2009, he was facing wars on two fronts, and both of those wars could not be won from the AirLand battle concept or the technological superiority of stand-off weapons and unmanned systems. While those particular technologies offered greater surveillance capacities, as well as strike capabilities (given the permissive air environments at this point), they were not sufficient to enable the US “win” in any way, shape, or form. Moreover, the US’s shift from an AirLand battle concept to an AirSea Battle concept began with thoughts on how to counter the A2/D2 strategy in the Pacific and Persian Gulf. Initial musings around 2003 led to a report in 2009 and its formal adoption as doctrine in 2010 (Krepinevich, Watts and Work, 2003). While Obama has consistently discussed his “pivot to Asia” and the importance of the Asia Pacific region, he has had to pursue those grand strategic objectives in the face of scheduled troop drawdowns in Afghanistan and Iraq, but also multiple exogenous shocks to the system and the region. He still supports the doctrine, as is apparent in the newly released “Joint Concept for Access and Maneuver in the Global Commons,” which is a revision of 2010 AirSea Battle to include a land force option. But Obama’s support of the AirSea Battle is due to the changing strategic and technological landscape. He is not merely “reactionary” as Scarborough suggests, but choosing amongst the various bad options that continue to present themselves. In the Middle East, those bad options, however, are the result of a Cold War mindset that enabled the fist Iraq War and shaped initial strategy in the second Iraq War. Moreover, while Obama has attempted to accept the strategic shift, he does adhere to a “blind ideology,” as did his predecessor and all US presidents since Roosevelt: the ideology of technology. The ideology of technology is a belief that one can create a technological solution to any problem, while minimizing costs in both lives and monies. This ideology is the more pernicious belief than what some might ascribe to Bush 43 or his cronies. While technology has its uses, it is not value neutral. It manifests the values of its creators, and it shapes the opportunities and decisions of those who will yield it. Much as how we saw a technological itch the US desired to scratch in 1991. Moreover, the ideology of technology can also blind its possessor, particularly in the face adversaries who will use it against them, to otherwise foreseeable outcomes, such as in the Iraqi insurgency. Understanding the “disarray” of Obama’s Middle Eastern foreign policy decisions is to understand the grand strategic setting, as well as how his presidential inheritance was bound up in a technological path dependence, a country’s war weariness, massive economic shocks to the global economy, the Arab Spring—which few if any saw coming—and the continued Cold War geopolitics of Russian allies and spheres of influence. While this is no apology for Obama’s decisions during his tenure, one can only begin to appreciate them in this larger and longer context. Additionally, through this perspective we can see Obama’s acceptance and support of the ideology of technology. His is not merely carrying on this ideology; he is doubling down. Case in point: he has expanded the use of unmanned aerial vehicles, and his increased funding of activities for cybersecurity and CYBERCOM amidst shrinking defense budgets. His vision is to further bolster the ideology of technology as the US’s primary means at securing its power and safety in the future. The turmoil in the Middle East and the US’s ability to effectively pursue its foreign policy there requires looking further back than Bush 43. It requires understanding Cold War rivalries, proxy wars, arms races, family histories, military strategies and weapons capabilities, management styles, and last but not least US domestic politics. Historians, or better yet political scientists and foreign policy analysts, cannot but look beyond the last fourteen years to understand the current thinking, and if they do not, they should. Curiously, you don’t mention the importance of studying the history and domestic politics of regimes in the Middle East/West Asia as a critical factor in constraining, frustrating, and shaping the efforts of US foreign policy — even though you imply that this is what is actually frustrating the ability of bring techno-military might to bear on the management of the region. Thanks, this looks interesting. Iraq was only one piece though, but an important one. I was trying to show a larger and longer strategic setting too. I do think this is quite important, and definitely a factor. I don’t think I was implying domestic politics was constraining the techno-military might, but rather a foreseen tactic by an adversary who does not equally match the US’s capabilities. I do wave at some of the domestic factors and alliances as crucial to understanding the US’s motivations and limitations, but given the space, I wanted to push on the technology side of things a bit more. Thanks for the comment!